The love tester I found was using heart-rate to assess the player which was being captured by a pulse-oximeter. Obviously, I gave the device a whirl and being only the tiniest bit full of myself I thought I would score “Out of Control” on my first try. Sadly no such luck, I scored a measly 2 for a “Mostly Hot Air” rating. Not to be out done by the love tester I decided to game the device using a heart-rate monitor. Using the monitor I could determine how the love tester was mapping my heart-rate to the rating scale. This is a relatively easy task as early biofeedback tech commonly used linear models which are easy to recreate from just a few sample points. Once I had the model I could easily induce a heart-rate which would select the love rating I wanted. 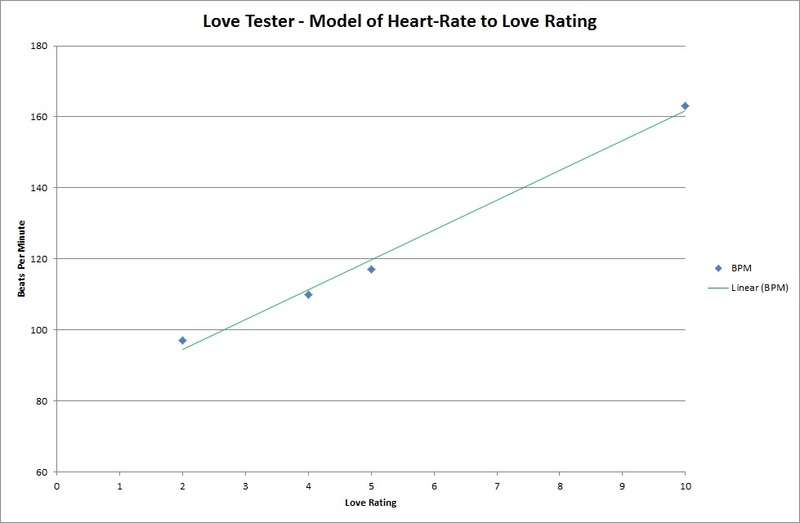 In order to create the model I would need to input a range of heart-rates into the love tester. 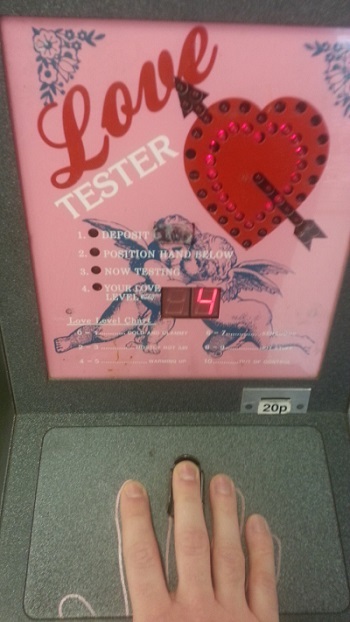 Unfortunately the love tester isn’t located in an ideal place to induce a nice range of heart-rates, with no place to sit down, and a walk away from work, I had to contend with the fact I wasn’t getting my heart-rate under a 100 beats per minute. Subsequently if I couldn’t get my heart-rate down I had to push it up. I’d imagine the scene looked awfully strange to a bystander, a random guy running around a love tester checking his watch the entire time. Below is a linear model I created from four data samples. Basically the love tester will label anyone with a very high heart-rate as a Casanova. I imagine the developers set such a high rate because as a device that requires the player to stand, their baseline level is already going to be high. I find it rather amusing that the pinnacle lover ends up being either a very unhealthy or very exhausted and thereby sweaty person. * I couldn’t see any overt company logo’s on the stress tester. A cursory glance online indicates the manufacturer is either defunct or no longer operates in this market. Co-edited with Stephen Fairclough. 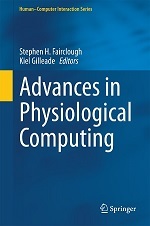 An edited collection of the latest research on Physiological Computing.